Check out These Cool Apps from an Early Student of Learn OpenGL ES! An early student of Learn OpenGL ES, Miguel, has been working on some neat apps lately. Miguel was one of the first readers at Learn OpenGL ES, and we’ve exchanged at least a few emails back and forth about different topics, such as working with the camera through matrices. We were both learning a lot back then, and that sort of interaction really helped to strengthen my own personal knowledge of OpenGL. 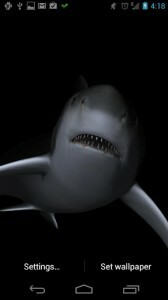 Miguel hasn’t stopped learning, and he recently sent me over a link to his live wallpaper, “Shark 3D Kosmos”. I’m really happy with the progress he’s made so far; read on to learn more! This wallpaper features a scary and realistic shark swimming on your home screen! The shark can be rendered in different modes, including holo mode, and you can select from several different camera modes, including one where the shark swims straight at you! The live wallpaper even includes features to save battery usage. 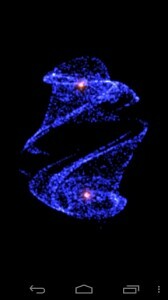 This is a neat dynamic simulation of the attraction between the center of a galaxy and its surrounding stars. You can move the simulation around and add galaxies in realtime. I’m happy with how far Miguel has come since the first lessons here at Learn OpenGL ES. If you’ve also learned from the site and would like to showcase your work, let me know! I learned a few things from your tutorials, very good stuff. They actually helped me transition from Android’s 2D Canvas API and over to OpenGL. My first 3D live wallpaper, Exodus (https://play.google.com/store/apps/details?id=com.joko.exodus), was featured on the Play Store for a while, and is still featured in the Personalization and Staff Tablet Picks sections. This reminds me I need to add this site to the Credits section of my About window. Your 3D live wallpaper looks really nice, Josh! No rush on adding to the credits, but that would be much appreciated. Would you like to be featured in an upcoming post as well? Let me get back to you in a couple weeks, I’ve got another LWP coming out soon that can be included in a featured post. What’s the best way to contact you? This is really awesome. Now, I got the basic idea hoe to start with Opengl. Awesome!If I can do that,I will very happy.